Brave Appletonians demonstrated their bold, thrill-seeking attitudes, while commemorating Appleton client, James Seneff, Jr. 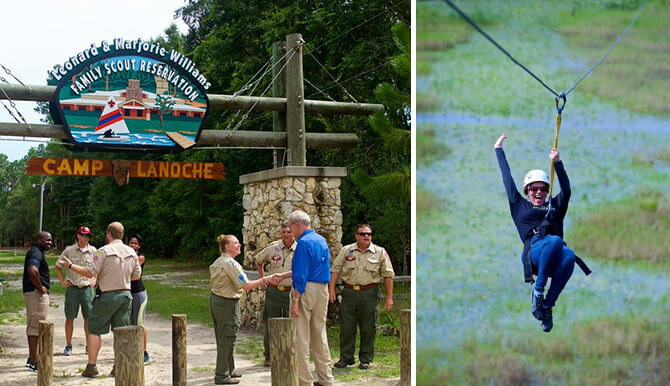 The Boy Scouts of America Central Florida Chapter hosted a dedication ceremony for Seneff and his family, who are devoted supporters of the Boy Scouts. Appleton supported the Boy Scouts of America Central Florida Chapter by donating a video of Mr. Seneff for the ceremony. The newly reconstructed area at the entrance of Camp LaNoChe’s dining hall was named Seneff Family Plaza, after their contributions to enhance the camp. James Seneff, Jr. is chairman and CEO of CNL Financial Group, a leading alternative investment company that offers more than 40 years of experience. Known for our generous spirit in the Central Florida community, Appleton Creative is proud to see the extension of charitable qualities among our clients. The dedication ceremony for the Seneff Family Plaza featured a zip lining experience that only the most courageous Appletonians dared to undertake. In addition, we were given an inside look at the camp and enjoyed a delicious dinner after the ceremony. Appleton Creative is honored to be part of such a great cause and the recognition of our client. Take your brand on a creative adventure. Appleton Creative is an award-winning, full-service advertising agency located in Orlando, Florida. Appleton works with local, national and international clients to provide marketing strategies through print, web, social media and video production – all in-house. At Appleton, we want to learn about your business, empower your marketing team and be your creative resource. Your marketing goals are worth a conversation: contact us at 407-246-0092 or info@appletoncreative.com.